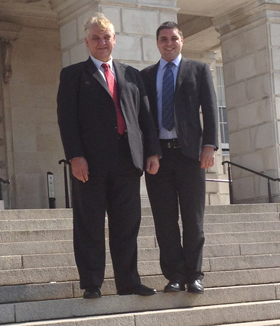 Councillor Henry Reilly and representative Alan Lewis on the steps of Stormont. Mournes Councillor Henry Reilly and UKIP Down District representative Alan Lewis have been elected to senior positions within UKIP. On Thursday evening the UKIP Northern Ireland members held an AGM in the Randisson Blu Hotel in Belfast and the meeting was attended by Paul Nuttall MEP. Councillor Reilly was unanimously re-elected as UKIP Northern Ireland chairman and Alan Lewis was elected as UKIP Northern Ireland treasurer.